THE BIGGEST NAMES in show business were out in force last night for the Met Ball in New York. 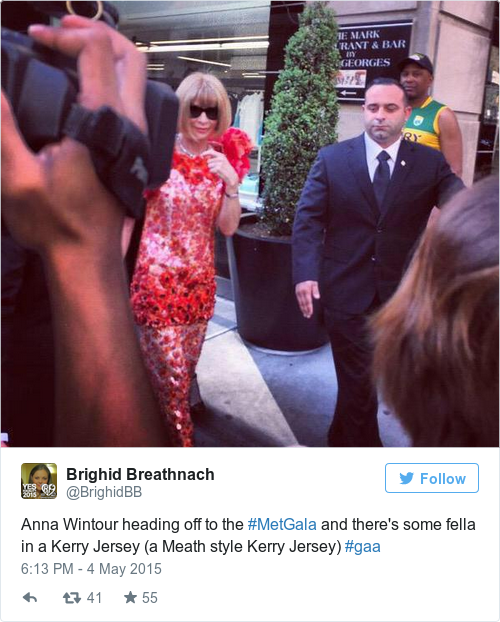 There may have been a China theme at the annual event, which raises funds for the Metropolitan Museum of Art, but that didn’t stop some lad showing up behind Vogue editor Anna Wintour in a sleeveless Kerry jersey. Email “A lad in a Kerry jersey turned up in one of the most random places last night ”. Feedback on “A lad in a Kerry jersey turned up in one of the most random places last night ”.